Hi ! I’m new to Plone and I tried to install it on my machine using the unifiedinstaller for mac, I got the message which said that Plone is successfully installed but in the browser I can’t see the welcome page when visiting localhost:8080 instead I have the apache page with the mention ‘It worked’. Then I tried to do the same thing with Mamp and when I visit the url localhost:8888/Plone it displays an index with all Plone directory contents. Any help please ? Are you sure you use the right port. Usually, the web sharing on OS X uses port 80 (and is where you usually see the ‘It worked’ message (from apache). 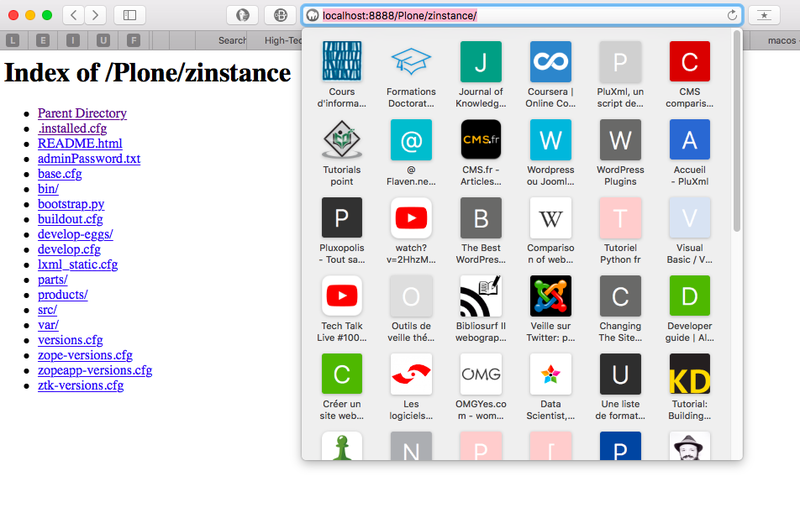 I dont know how to install Phone with Mamp (only wordpress), can you paste a screenshot of ‘the index with all the Plone directory contents’ ? My advice, forget the whole Mamp thing, what you see is just the (downloaded files) not a ‘website’. Later, you might want to start with ‘bin/instance start’.